Heat oven to 350°F. Cut cookie dough in half lengthwise to make 2 long pieces; refrigerate one half until ready to use. On floured surface, roll half of dough into 8x5 1/2-inch rectangle (use edge of ruler to make sides straight). With sharp knife, cut dough rectangle crosswise into 4 (5 1/2x2-inch) rectangles (see diagram). Cut each small rectangle diagonally into 2 triangles; place triangles 2 inches apart on ungreased large cookie sheet. Bend tops of triangles as desired to resemble stocking caps. Bake 7 to 11 minutes or until edges are light golden brown. Cool 1 minute; remove from cookie sheet. Cool completely, about 15 minutes. Repeat with remaining half of dough. Divide frosting into 3 small bowls. Leaving 1 portion white, stir red and green food color into remaining portions. 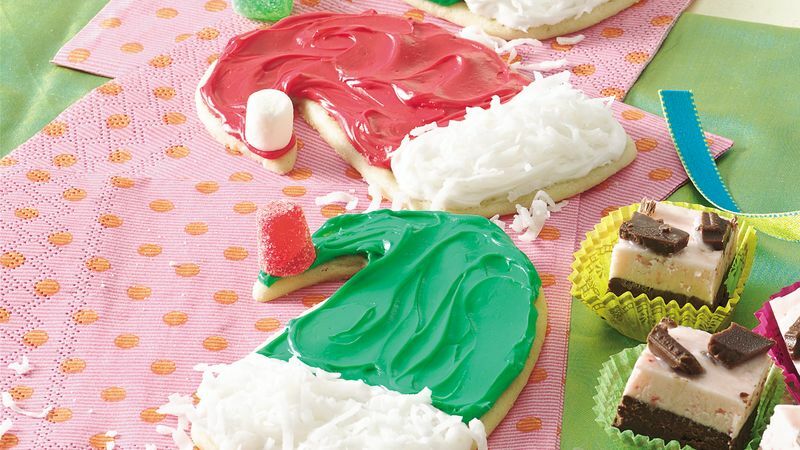 Frost each cookie with about 1 tablespoon red or green frosting. Frost about 1 inch of short side of each triangle with about 1 1/2 teaspoons white frosting for hat brim. Sprinkle brims with coconut. Place marshmallows on ends of hats for tassels. Let stand until set before storing. If your children don't like coconut, use miniature marshmallows to decorate the hat brims.